To celebrate the new addition to my shop I will hosting a giveaway with my favourite English Paper Piecing gal, Joanne from PBPatch. Joanne supplies a comprehensive array of precision die cut papers and fabric shapes to suit any EPP project. I am so excited about her new “Cut to Order” section of her website where you can mix-and-match any Moda layer cake with any shape/size die-cut and it will be cut for you. Ingenious! Look at some of the beautiful Rose Stars Joanne has made. Fussy cut heaven. 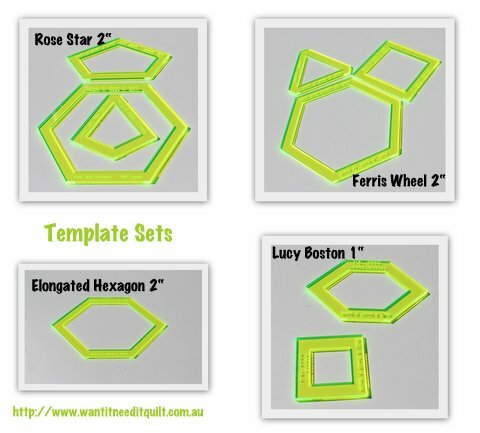 One lucky blogger will receive a complete set required to make the Rose Star, Lucy Boston and Ferris Wheel plus a pack of papers to get you started. Write a comment telling me about the amazing things you would make if you won. Good luck! The winner will be drawn Sunday 2nd September 2012 AEST. « The DHWQ is Finished, Yay! Oh my goodness. Is it one post if you do all of those, or one comment per? I do all of them, so I will start with just one post. I would make a lovely full size quilt for on our futon when we have guests over. I would use pinks, and yellows and teal, and light greens, and oranges, and purples in the rose stars.. oh my gosh, I am really excited and thrilled to have a chance in this giveaway. place mat's and mug mats or a wall hanging would be nice.Drawn the day after my birthday would make a great birthday gift lol. If I won I would make a set of cushions for a good friend who's currently renovating her house. Hello! Beautiful blossoms, indeed! I would make some beautiful blossoming cushions. I follow your blog via email and gfc. I would use the templates to make all sorts of designs to make fronts for bags. I also would make quilt tops or pillow tops. And I already follow Joanne's blog 🙂 I love her charm pack hexies, and one day aspire to give them a go! I'm following you! I'd make pillows! And I follow Joanne's blog. I've been wanting to make some of those complex EPP blocks for so long. They are just lovely. I think I would start with something small – like a bag. I'm following you via Google Reader/RSS. I am now following Joanne's blog. I also am a big time stalker! lol. I haven't done paper piecing before, so I'm not sure what I'd make, but I think I'd start with hexagons! Sigo Joanne no GFC também.Obrigada.tiacarminhapezzuto@gmail.com. I received a lovely surprise recently – Jane sent me a sample set of the new Rose Star acrylic templates! I love them – they certainly make it a lot easier to cut out my fabric pieces. And they match the sizes of the die-cut paper pieces I make! The finished Rose Star blocks are about 12" by 12" so they are the perfect size for a cushion or bag. Christmas is just around the corner, so maybe a table runner in Christmassy colours? I have never done any EPP, but an interested in learning. I think these would make cute little table runners. I am now a follower of Joanne's blog. Thank you for heading me to her blog, by the way. I loved what I saw. I hope this is open internationally as I'd love to win these. Have looked here in the US for them but so far no luck finding them. I already follow you & signed up to get Joanne's blog too. I follow Joanne's blog…love her selections! 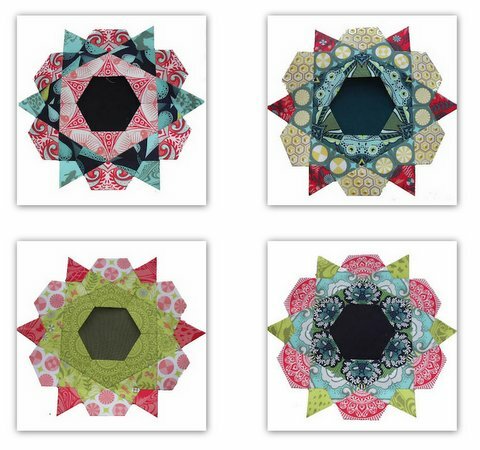 i'm planning a hexie quilt using various sized hexies, so thanx for the intro to joanne's blog! had a good time browsing her blog and hexie pax, too. am not a seasoned epp'er, but have tried various methods of basting, and settled on folding and tacking at the points, and am still switching back and forth between a running stitch join and a ladder stitch. am cutting strips just big enough for six hexies for a flower, and using scraps for single hexie flowers. am going to use BIG hexies to machine join them for a background piece out of neutrals. there are so many ways to use hexies! i've gfc'd joanne' blog! love it! Following both blogs! I never EPPd so probably would start small with some cusions for our new bed! I already follow you both. I have done a few hexi projects and would love to branch out into other shapes. My best tip would be to tack the fabric without going through the paper – makes the shape very stable (you leave the tacking thread in place) and the papers are really easy to remove. And a follower of Joanne's blog! In fact I have bought papers for my Rose Star (Jazz Hands) block, so these templates would be very handy! I have always wanted to make a Lucy Boston block/quilt! Oh wow! I am a happy follower of you blog! And I think I would make a quilt. Really love this pattern Rose Star. Looks wonderful! I am a new follower of Joanne's blog! If I won Id make a quilt with the Rose Star templates…an EPP tip, always start and end with a figure 8 knot. I'm following both blogs. I've made a lap quilt with another in process as well as a few zippered bags. I've always admired the fussy cut projects but I haven't done one yet. Thanks for the chance to win. My best tip is to make it portable! I made a luch bag (free tutorial online) and put all my bits in there, I sew at sports days, doctors etc! I love EPPing. I like to baste without stitching through the paper, then you can reuse the papers and still leave the basting in to keep the seams in order. I'm also a follower of Joanne's blog! Oh and I follow Joanne too! I would make an amazing quilt if I won those template's! I have stalked you for a wee bit o' time. Thank you for sharing Joanne's blog. I am now stalking her as well. Even though the patterns you chose are very feminine, I can see my self doing one for my cousin in boy type colors & patterns. Possibly in flannel plaids. Ohh, I am getting all snuggely warm thinking about it. As for a tip in epp: timing & patience is my biggest tip. That and the ladder stitch. How I love the ladder stitch. It makes everything lie so flat when its done. Mind you the only epp I have done is on a 4 foot by 7 foot, 3 quarter inch hexagon gargoyle. Following the colors has been hard-ish. I've only ever done hexagons! I'd love to try some different shapes! I am a English paper pieced virgin (even though I am English) so I would start with a cushion. Those rose stars have opened my mind to infinite ideas. It will make a nice change to be able to spend some time in the same room as my husband and still quilt instead of behind the sewing machine. I have not ever done EPP so I'm not sure what I'd make. I'll probably try basic EPP flowers. I'm a follower of your blog and enjoy your posts. I've done some paper piecing but would love to try more. I'm now following both blogs. I would make some double sided snow flakes for Christmas to hang off the beam in our living room. Tip. Once you have joined some of your epps together, you can remove the papers and starch. This can cut down on the papers required for projects. Well I already stalk you hehe!! So excited for this giveaway! My best tip for EPP is that I leave my basting in. I HATE basting at the best of times so why baste through the cardboard and then have to cut it all out when I don't have to! I do have a tutorial on my blog on how I do my hexies if you would like to see! I already follow Joanne! That is where I learned about this giveaway! I would make a quilt for my mom who has congestive heart failure and is cold all the time. I have been wanting to try this pattern for a while. I would make square pillows for my bed. I am following both blogs. I follow you by e,ail. I want to make the Rose Star. They are just gorgeous! I'm already a follower…would love to give EPP a try…thanks for the chance to win! If I won, well, I guess thats the kick up the arse I've been waiting for to join in with those fabulous Rose Stars! I am in awe of those Rose Stars . Beautiful . I have just made a similar one for the first time in Rachel's Handstitched class . It was my favourited project . Would love to make more . Im already a follower of your blog . I now follow Possum Blossom Patchwork! Wow- I really want to learn English paper piecing. These templates are amazing. I would love to make a quilt for my Mom- out of fabrics that have flowers on them. I follow you & I now follow Joanne as well. I've not tried any EPP as yet but would love to – I imagine I'd start with a fairly easy block or mini quilt. Thanks for the lovely giveaway. I follow your blog….what a great giveaway!! I love to EPP….just started it recently and working on my first quilt which is ALL hexies…what I wouldn't give to get my hands on these templates….love them!! These look like some of the AHHH's that I have been doing. Love the star set. I'd just be making more and more stars. Love them. I would really love to learn english paper peicing. I would so make a sewing machine cover for myself. I would love to win these. I would probably make pillows. …am now a follower of Possum Blossom Patchwork. I have never used a paper piecing template! I'm not sure what I would make – probably something small initially (mug rug?) to try my hand at it. I also follow Joanne's blog! I am no seasoned expert. I procrastinate EPP. But I'm needing some good hand sewing while watching TV at night once I've collapsed on the couch, so I'm trying to get back into it! A long term project is what I need, especially when flying back home next Feb for a few weeks! These kinds of EPP are probably more my thing – each piece adds to a bigger picture! Thanks guys! I'm an ongoing follower…I follow by email and enjoy receiving your posts. I'm following Joanne now! Thanks for introducing me to her. I would love to win this one. So far, all I know how to do with EPP is hexies. I love them, but I'd love to expand my skills. Thanks for the generous giveaway! I have now staked both of you. Thank you for introducing me to another blogger here in Australia. I would love to make a quilt using the templates is you some of my Kaffe Fassett stash and have the swirling over a bright background. I am a regular follower of both of your blogs! I am not an experienced paper piecer; I have started by doing hexagons, and it is definitely addicting! Thanks, Jane for telling me about your giveaway. And, as I said to your friend, Joanne……. "Thanks to Pat Sloan, I found Jane's blog and then thanks to Jane's blog, I found your blog. Love the Rose Star blocks!!" I could make lots of beautiful fussy cut projects because I have some "oh, so perfect" fabrics that are just waiting for your templates. 🙂 Also, I love hand-stitching! I am a follower of Joanne's blog.